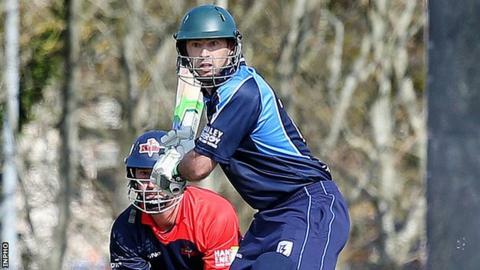 Leinster Lightning moved a step closer towards retaining their one-day Inter-Provincial title by beating Northern Knights by 158 runs at Anglesea Road. A win for Lightning against the same opposition at Waringstown next Sunday will secure the championship following their bonus-point victory. Leinster were 320 all out off 49.5 overs, with John Anderson top-scoring with 76 off 82 balls. Northern Knights could only manage 162 all out off 33.5 overs in reply. Andrew White was their best performer with the bat, scoring 57 off 84 balls. Eddie Richardson was the pick of the Leinster bowlers with 3-26, while John Mooney and Anderson took two wickets apiece. Lightning had set a substantial target, thanks primarily to the efforts of Anderson, Tyrone Kane (57) and Dominic Joyce (36). Shane Getkate finished with figures of 4-48, with Mark Adair and Peter Eakin both claiming a couple of wickets.